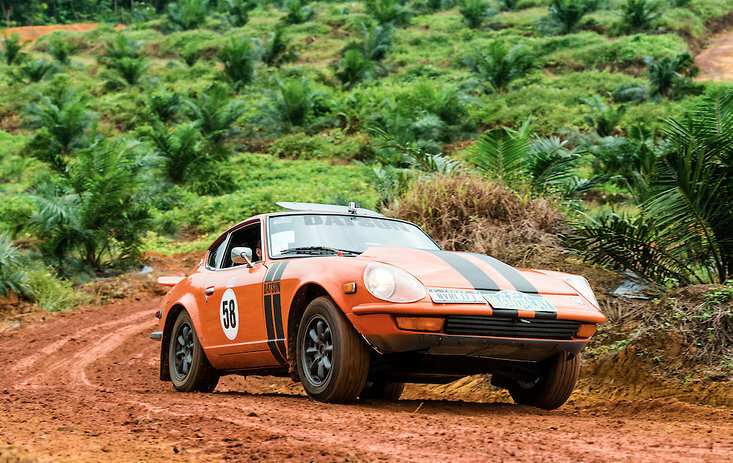 This 24-day, 8,000 km endurance race event kicks off from Singapore and runs February 1-24, 2015. With Burma opening up after years of isolation, our ambitious route will drive from Singapore through Malaysia and Thailand and on into Burma on the Road to Mandalay. 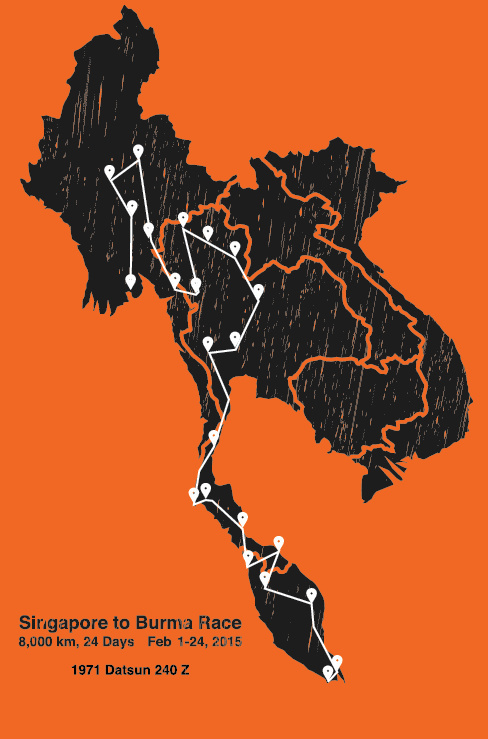 The start will be from The RRoad to Mandalay Mapaffles Hotel, Singapore on February 1, 2015 and drive up through Malaysia into Thailand and on into Burma, finishing in Rangoon after driving the road to Mandalay. You can follow our race once it gets kicked off on February 1, 2015 my book marking and visiting this blog. 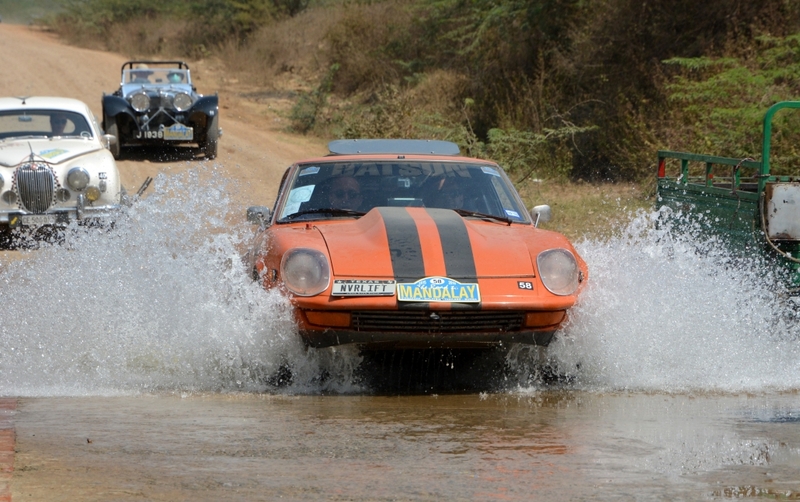 We successfully completed the race on Feb 24, 2014 along with 55 other cars that crossed the finished line. 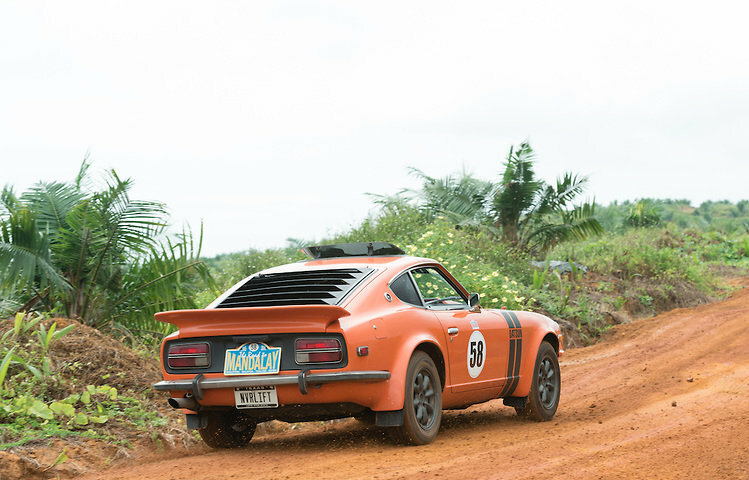 Visit our Album by clicking this link to view pictures of our race — from the day we bought the 1971 Datsun 240z to the completion of the race at Bagan, Burma on Feb 24, 2015. 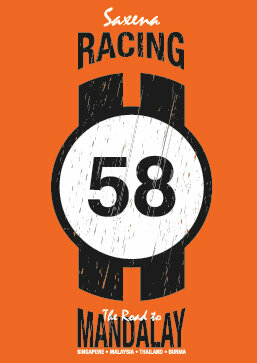 Follow us on Twitter @SaxenaRacing to get updates on our next epic race .. THE SAHARA CHALLENGE this October from Madrid to Marrakesh in October 2015. More information on this link. 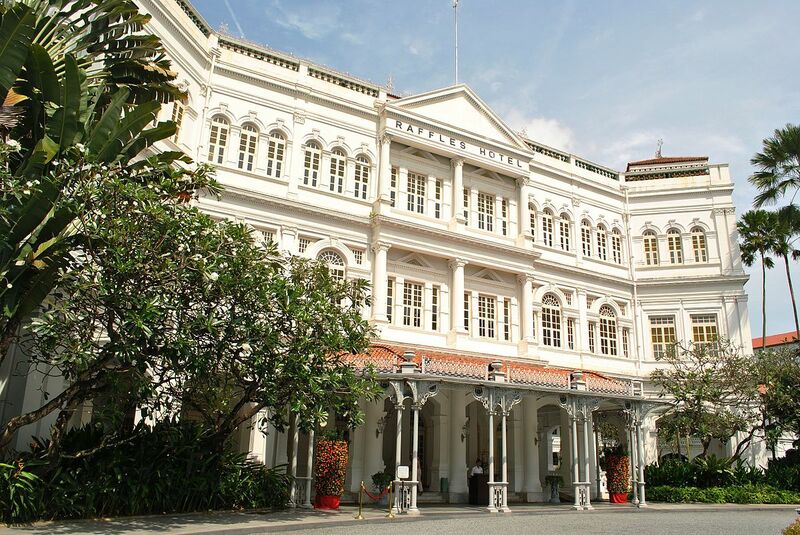 Following what should be an extremely pleasant experience, adjusting, acclimatising and generally kipling at the iconic Raffles Hotel, the route leads out of Singapore to the Malaysian border; a short, transport run. Following formalities, it then heads for the south west of the peninsular for a short run up the coast before cutting inland over a variety of straight and meandering roads, mainly through palm oil plantations. Some pleasant main roads lead to the first time trial which will, if dry, as forecast, dispel misconceptions that oil plantations are slippery; if not dry then…….! Following the time trial, on to the beachfront overnight halt at Desaru, on the SE tip of the peninsular via a brief diversion to a scenic fishing village. From Desaru we head north, traveling parallel with the coast before turning inland to join and follow the Pahang River. The route crosses some impressive rivers, which are alive with fishing, ferry and related activity; really quite picturesque. Following a brief lunch halt at the Wawa cafe, it is on to the Boustead time trial over a “young” plantation, that is, it has been recently replanted and is very open and “visible”. Then on, with a lovely run down the river, to the overnight stop at the coastal city of Kuantan and another relaxing night in the Hyatt beach front hotel. Out of town and inland on a sweeping major road before heading into the country and a delightful jungle drive; almost a botanical park which takes in a “rustic” coffee halt. Demands on navigation increase and lead through some quiet, interesting backroads to arrive at the lunch halt. On from lunch and a “nadgery” time trial leads to the ascent of the Titiwangsa Mountain Range involving a 76km alpine climb. After a great days driving, finish the day, perhaps with a cup, or two, of the local tea, at the Cameron Highlands, Malaysia’s most extensive and famous old colonial hill station. A downhill day, initially, with an early, and probably misty, departure for the frontrunners, to descend the mountains to the Kelantan River valley and a time trial into the unknown; that is, on the recce we encountered a tarmac machine, so it could be 50/50 or it could be full tar! Continuing North West, the route follows some delightful jungle backroads following a waterfallside, picnic lunch. The route into town involves a ferry crossing to a narrow track through rubber plantations to the run in to Kota Bahru and the Riverside Hotel, located on the side of the river! In case of unusually high ferry traffic and for those prone to “mal de mere”, there is an alternate route! From Kota Bharu, we run alongside the Thai border. 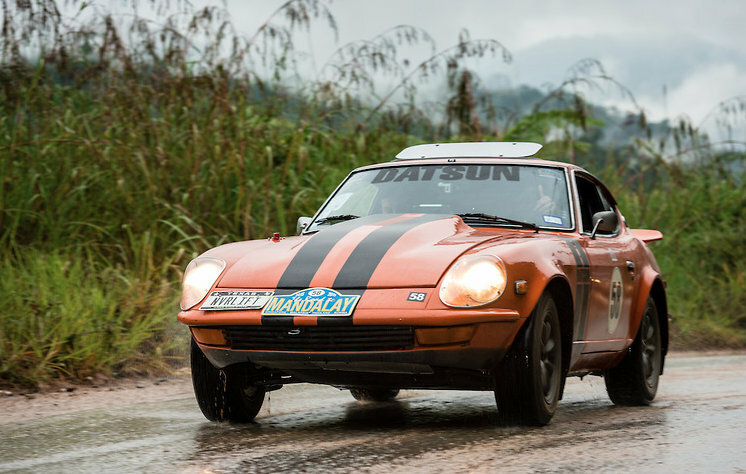 A spectacular route crosses the mountain range, bound for Georgetown on the beautiful island of Penang, where two nights will be enjoyed, providing an opportunity for some rest, recuperation, and also to fettle your car with the help of our travelling mechanics. Coffee will be taken at the summit before meandering down to the start of the next time trial, the “Tour de France”, a classic Hillclimb favoured by the local cycling community, and then on via the newly completed, 24 km, “2nd Bridge” to make a clockwise tour of the island and a well earned rest at the E & O, Georgetown. 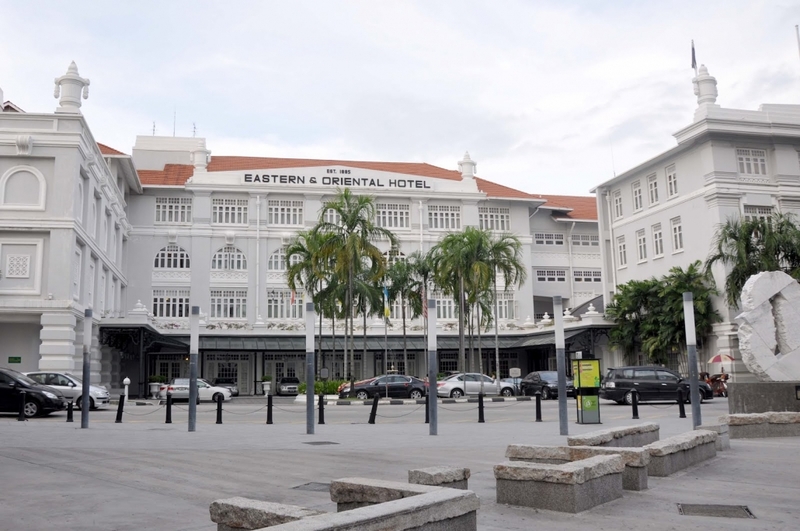 A rest day and an opportunity to catch some sun, relax and explore the historic, Portuguese influenced, colonial city and/or grease those steering joints, adjust the brakes and enjoy a shoulder massage in the classic ambience of the E & O – once hailed as the premier hotel east of the Suez. Leaving Georgetown via the old bridge, a transport section leads upcountry to the final time trial in Malaysia. A technical test, the “Fields of Athenrice”, courtesy of Pad Dee and the local community, demands precision, with no room for error, and no shortcuts! Then, it is “Selamat Jelang” to Malaysia and into Thailand via the border crossing at Wang Kelian, a delightful backwater frontier complete with Duty Free, but no commercial traffic. 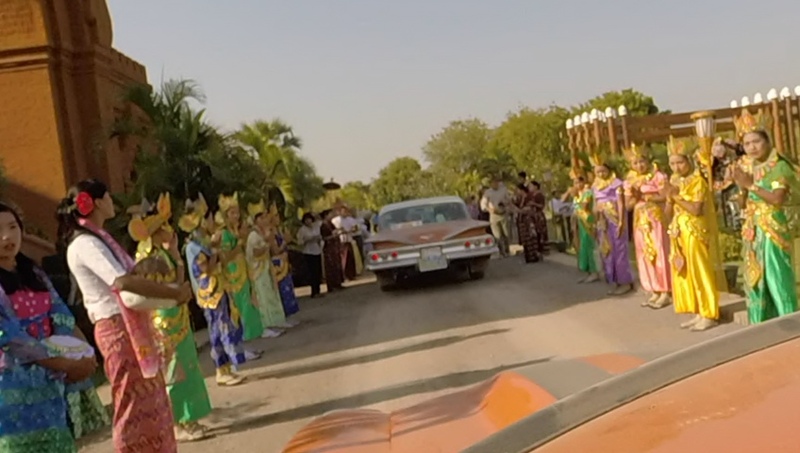 Formalities over, the route runs through good main and back roads, taking in the distinct cultural differences that Thailand presents, to a charming Thai welcome at the Rua Rasada Resort, at Trang. A busy day as the route heads for Khao Lak via a brief detour to the island of Phuket. Some open driving, with some navigational elements leads to coffee at “Cabbages & Condoms”, where those running short on Brassicas can resupply. Then the fun starts; through the “kargs” (limestone outcrops) to a regularity, of “waltzer” nature, leading to lunch before a navigational detour, prior to crossing the Sarasin Bridge onto Phuket. 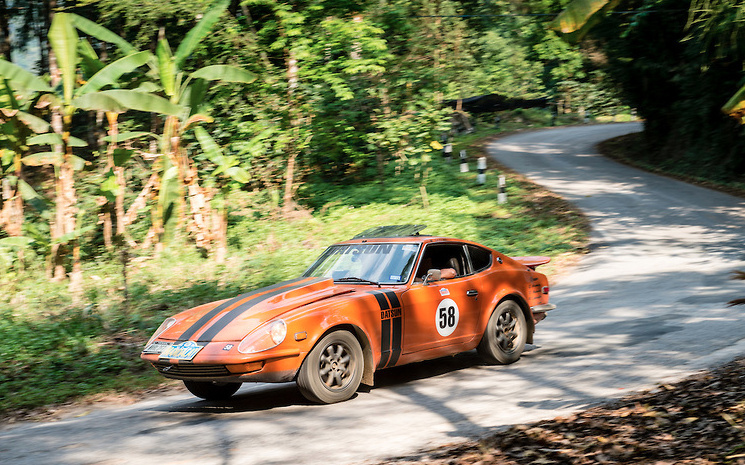 A double run over a “gradiently challenging” road will thrill, or otherwise, before a short coffee halt to reset the adrenaline sensor and then a testing route through the forest to Khao Lak. Departing Khao Lak, the route takes in some rural backroad navigation before joining the major road north up the West coast. Turning inland, the terrain is mountainous and the road becomes serpentine with continuous ascents and descents as it crosses to the east coast, throwing in a few surprises on the way. Finally, it crosses the main, arterial highway and onto the Novotel, on a beautiful stretch of coast to the east of Chumphon. From Chumphon we head to Kanchanaburi, and the (in)famous River Kwai with its notorious association with the Burma railway of WW2.The first half of the day is relaxed as we travel north up the isthmus before turning off onto more rural back roads, leading to the Kaeng Krachan Circuit, where skills will be tested. Then onward through some interesting country to our overnight hotel, on the bank of the river and the opportunity to walk the river bank and visit “The Bridge over the River Kwai”, built by Alec Guinness and Co.
A free start from the hotel allows those interested to visit the Hellfire Pass Museum and the notorious cutting created by the POWs on the Death Railway, before the official start from the museum car park. The route becomes increasingly scenic, climbing the Kwai valley before entering the jungle where a mixture of gravel, tarmac and concrete surfaces over steep climbs and descents present their challenges. 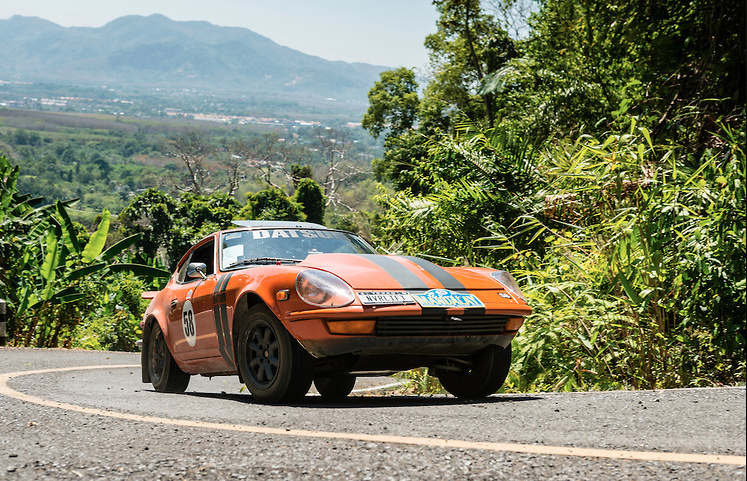 It then returns to tarmac roads and a non-stop series of rollercoaster climbs and hairpins to the Sri Nakarin Reservoir dam for lunch. From the dam we return for a second night in Kanchanaburi and a further opportunity to explore the town, railway museum and the war graves. 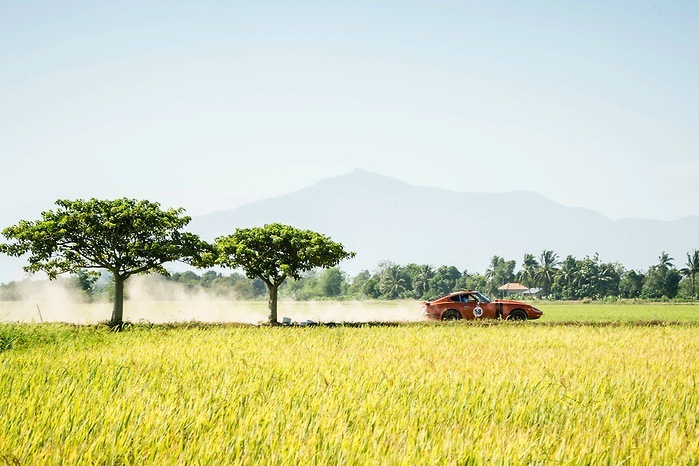 Today, cars and drivers can relax, to an extent, while the navigators concentrate as we drive through the central plain of Thailand with endless paddy fields, where the 3,500 varieties of rice are grown. There are some interesting sections along the route and a coffee diversion to a “bizarre” monastery, en route to the “Chicken Run” forest time trial which may require a degree of “machetising” to preserve the elegance of the competing cars. On finishing the time trial, it is on, northward to arrive at our night halt in Phetchabun; a memorable hotel, crammed with collectibles and paraphernalia. 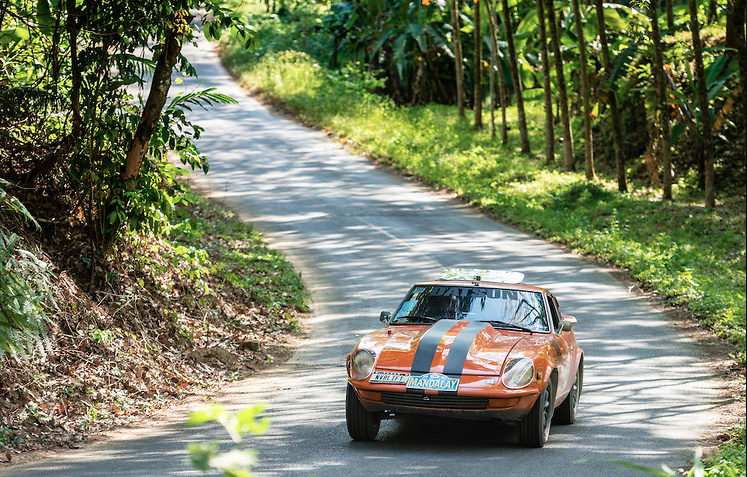 We are now in Northern Thailand, and in for some truly scenic driving. From Phetchabun, following a brief, optional pause to pay respect to the Buddha, a quick “warm up” detour to Khao Kho, site of King’s summer palace which is followed by an amazing 7km Alpine road climbing 5,000 feet to the top of Phu Hin Rongkla – site of the HQ of the Communist insurgents back in 70’s. There is a small museum there and a great drive down the other side to Nakhon Thai and then onward to lunch at a renowned floating fish restaurant, the location of which is TBA (depending on the level of the lake). 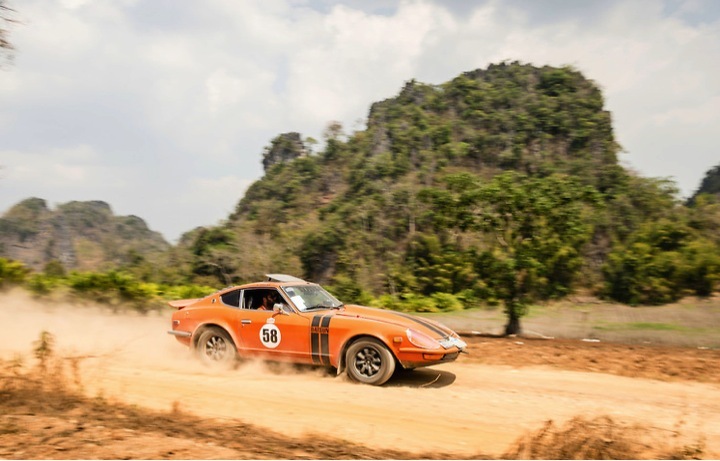 The day finishes with a demanding gravel time trial, through the clouds, over a jungle covered mountain and a descent of endless hairpins to overnight at the town of Phrae. Once out of town, a brilliant days driving awaits. 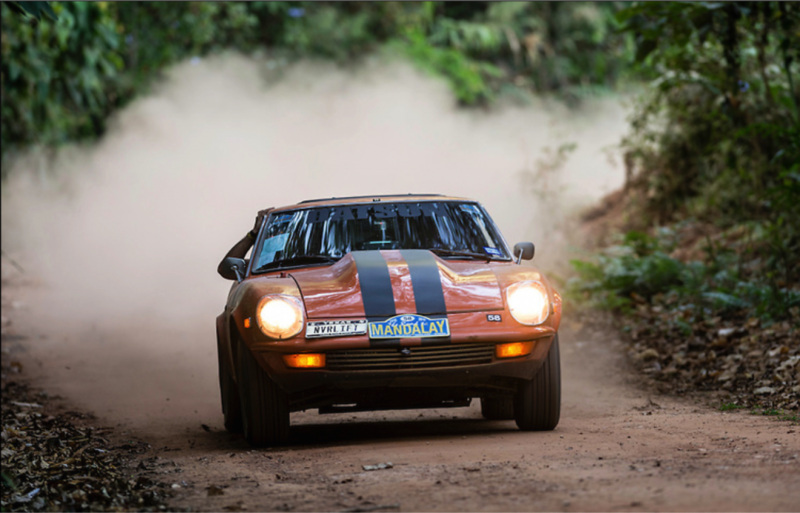 Fast, open curving roads with little traffic and some great alpine sections which will delight. However, just to break the rhythm, there is a short gravel diversion leading to the asphalt “Mount Columnar” time trial which is flat but extremely tricky and the late brakers must err on the side of caution!!! Following a lunch detour to an “offbeat” pub, the driving is all alpine until joining the run into Chiang Mai, attempting to beat the school run which can cause frustration! A top hotel, the Shangri La, will aid recuperation and our many local contacts might serve to supplement our team, mechanically! Otherwise, there is a huge choice of options to fill your time, if lying poolside is not your thing. The night market puts Marrakesh to shame and you can replace your wardrobe for less than the hotel might charge to sterilise your accumulated laundry! The restless might partake in some hill climb training by indulging in a, self organised, tour out of Chiang Mai, through the National Park and up to the peak of the highest mountain in Thailand, Doi Inthanon 2565 m.
A delightful drive out of Chiang Mai leads, via a good forest/jungle time trial, the “Tiger Trail”, to morning coffee and the infamous “Road 1095”, known as “The Road of a Thousand Bends” – in fact there are 1864; try counting them as you climb and descend. There’s time for a brief, recuperative lunch stop, midway, then on to a very welcome overnight stop at Mae Hong Son – the end of a truly exhilarating, if tiring day. Very slippery if wet! We are now in fairly “wild” country, close to the Burma border and “tribal” people will be seen selling their wares on the roadside; maybe a short stop to haggle for a machete would be time well spent. We now head south for the Burma Road, with a series of short ascents and descents, through the jungle with a fairly straightforward time trial to stimulate the adrenaline flow and then on, via lunch at Mae Sariang to join and follow the Salawin River which is effectively the Myanmar border. The route runs through some stunning scenery and many of the population are tribal, sporting traditional clothing and, to the west of the road, are the traditionally built hillside refugee villages. The overnight halt is just short of the Thai/Burma border, at Mae Sot. Remembering to drive on the Right of the road, leaving Mawlamyine, the route takes on a colourful nature where the essence is experiencing a quantum change in culture and scenery. The route takes a main road to the concrete “Express Way” which is deserted if a bit uncomfortable. However, it gets the event “up country” before diverting back to the main road for the run in to the “new” city, constructed as the seat of government – Naypyitaw. A minor tour of the city does take in the notable 20 lane highway which serves the “Flash Gordonesque” Houses of Parliament, before the “Hog’s Back” time trial along a mountain ridge to get us on the road to Inle. Due to fewer roads and various restrictions, the traffic is denser in Burma, but nevertheless, the drive to Inle is fascinating. A degree more patience is called for, particularly up the long climbs, but the overnight on the lakeside makes it all worthwhile. Early arrivers can take advantage of a tour around the lake and the floating villages. Finally we are on the road to Mandalay, immortalised by Kipling and the capital city of the last independent Burmese Kingdom before final annexation by the British, Mandalay remains the cultural heart of the country. The route from the hotel leads to an early time trial over open hillside farm tracks with few trees but some interesting features, then on to Mandalay over major roads which are due for reclassification or, at least, a degree of improvement, through beautiful countryside, littered with cultural interest to the start of a major descent to the valley and, at last, if not finally, Mandalay! We originally planned for the official rally to finish in Mandalay but after visiting Bagan we realised there was only one place for the event to finish and that is ancient capital city of Bagan. 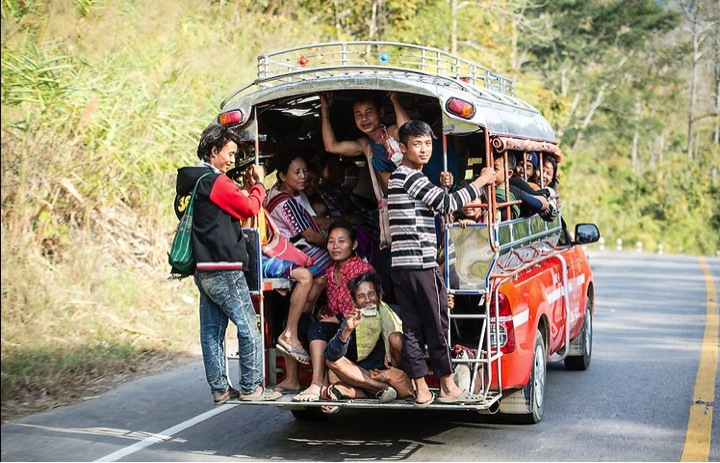 We take a typically Burmese country road, passing through many small villages and across country that is reminiscent of Africa, before arriving at the most spectacular and iconic spot in Burma. 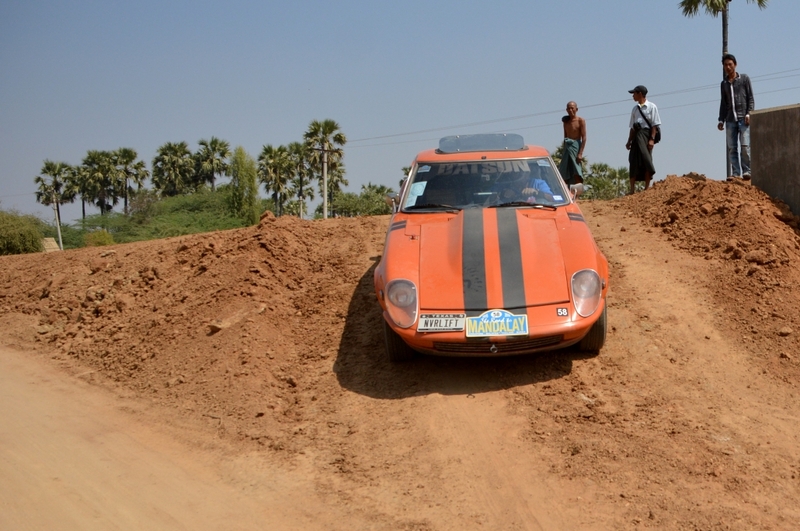 The plains of Bagan are scattered with 10,000 ancient temples and we finish the official rally in truly grand style, driving through the temples before celebrating a superb driving experience with the Prize Giving Dinner overlooking the temples, lit up against the night sky. From Bagan to Rangoon we give you the route instructions for the direct route back to Rangoon, but no timing. You can drive at your own pace, with the option of detouring through the unique capital city of Naypyitaw before heading south to arrive in Rangoon, a bustling old city with an air of a fading colonial grandeur absorbed by the pace of modern life; beautiful colonial buildings stand empty and decaying, while just down the road a modern high rise hotel is being constructed. It is a chance to see the old Rangoon before it might be lost forever.